6 for $85.50 total Need more quantities? One of our native Bee Balms, Wild Bergamot (Monarda fistulosa) bears delicate whorls of light lavender blossoms and softly hairy, aromatic, grayish blue leaves that can be dried and used in teas. This clump-former is more resistant to mildew and at home in an herb bed or perennial border. Deadhead to extend bloom and to prevent self-seeding. A favorite of butterflies and hummingbirds. Deer resistant. 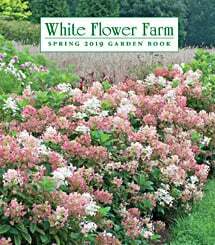 This North American genus has several species, all of which share tartly fragrant foliage and the square stems that typify members of the Mint family. The late-summer flower heads are hemispheres of tubular blooms in brilliant colors. Plants thrive in full sun or partial shade and evenly moist soil (which helps avoid mildew). For more information on the growing and care of Monarda, click Growing Guide. Choose a location in full sun or partial shade with moisture-retentive soil. In dry conditions, Bee Balm is susceptible to powdery mildew. For potted varieties, plant the crown at soil level. 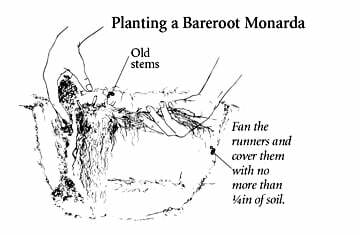 For bareroot varieties, plant with the old stems pointing up. Fan out the runners horizontally and cover them with just ¼" of soil. Mulch plants in spring and irrigate during summer dry spells. Plants spread rapidly. Divide every year or two in spring to keep them in check.